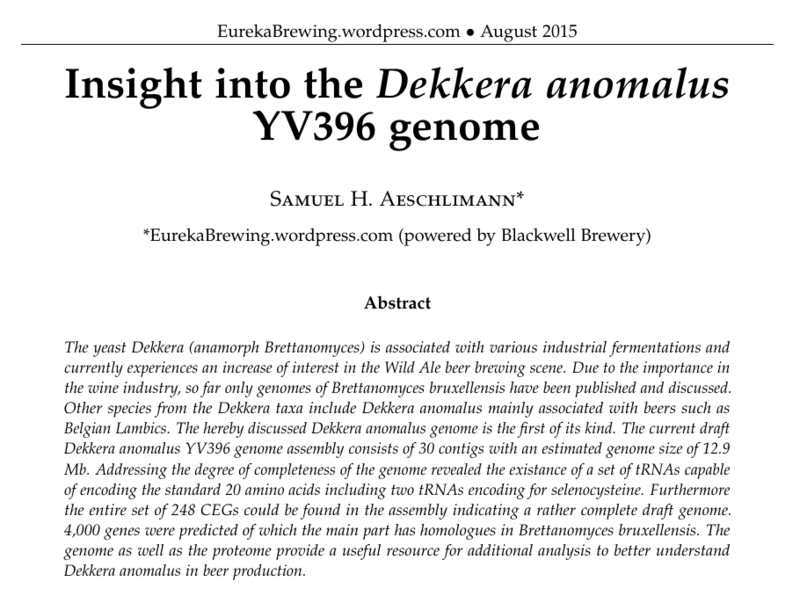 The draft genome assembly of Dekkera anomalus strain YV396 (isolated from a Belgian brewery) was retrieved from GenBank (accession number LCTY00000000.1; June 2015) deposited in May 2015 by KU Leuven [Vervoort et al.]. Illumina HiSeq data (100x coverage) was assembled into a genome using SOAPdenovo v.1.05. The statistics for the obtained assembly are summarized in Tab. 1. Gene prediction on contigs was performed using the AUGUSTUS web-service (AUGUSTUS parameter project identifier: pichia_stipitis, UTR prediction: false, report genes on both strands, alternative transcripts few, allowed gene structure: predict any number of (possibly partial) genes, ignore conflicts with other strand: false) [Stanke et al.2006, 2008]. The gene prediction statistics are summarized in Tab. 2. Gene annotation was performed by Blast2GO including remote blastx on NCBI and InterProScan for domain predictions [Conesa et al, 2005]. GO-term mapping and annotation performed by Blast2GO pipeline. Close to 3,000 out of the predicted 4,160 could be annotated by Blast2GO (Fig 3). Another subset of about 600 sequences could be mapped to a biological function without a GO term and about 460 sequences only resulted in BLAST hits which could not be further associated with a protein function. Most abundant species associated with the best blastx hits were Dekkera bruxellensis, Ogataea polymorpha and Pichia kudriavzevi (not shown). Conesa, A., Götz, S., García-Gómez, J. M., Terol, J., Talón, M., and Robles, M. (2005). Blast2GO:a universal tool for annotation, visualization and analysis in functional genomics research. Bioinformatics, 21(18):3674–3676. Stanke, M., Diekhans, M., Baertsch, R., and Haussler, D. (2008). Using native and syntenically mapped cDNA alignments to improve de novo gene finding. Bioinformatics, 24(5):637–644. Stanke, M., Schoffmann, O., Morgenstern, B., and Waack, S. (2006). Gene prediction in eukaryotes with a generalized hidden Markov model that uses hints from external sources. BMC Bioinformatics, 7(1):62. Vervoort,Y., Herrera-Malaver,B., Mertens,S., Guadalupe Medina,V., Duitama,J., Michiels,L., Derdelinckx,G., Voordeckers,K., Verstrepen,K.J. (2015) Purification and characterization of a novel Brettanomyces anomalus beta-glucosidase enzyme suitable for food bioflavoring – unpublished. This entry was posted in Projects and tagged Brettanomyces, Dekkera, Genome by eurekabrewing. Bookmark the permalink. Very cool – looking forward to the analysis!